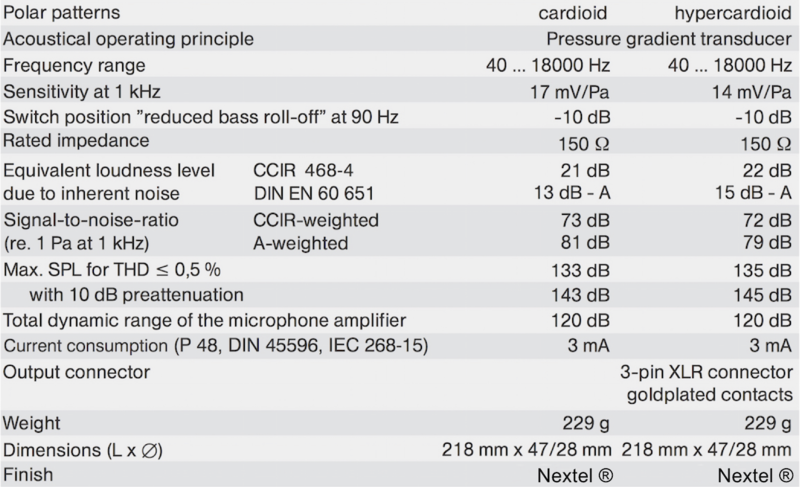 True large diaphragm capacitor instrumental and vocal microphones with a rugged Nextel finish. 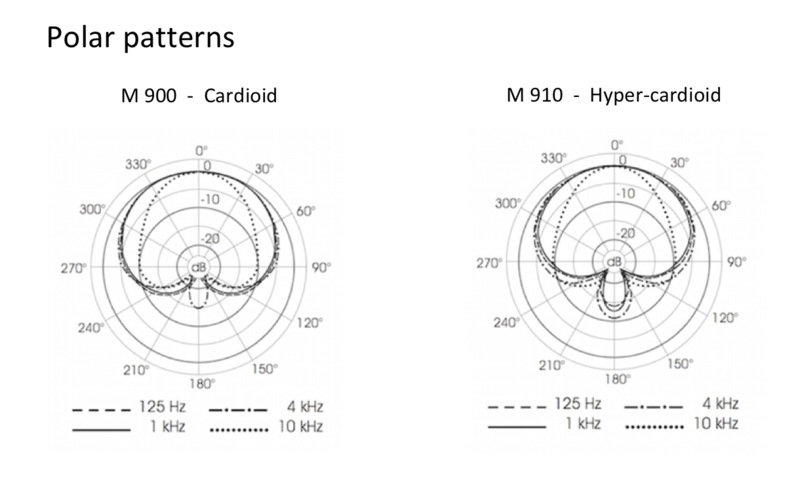 The M 900 (Cardioid) and M 910 (Hyper-cardioid) large diaphragm hand-held condenser microphones were developed for instrumental and vocal soloist use in the professional market, they have a well balanced frequency response in the free-field as well as in the diffuse-field. 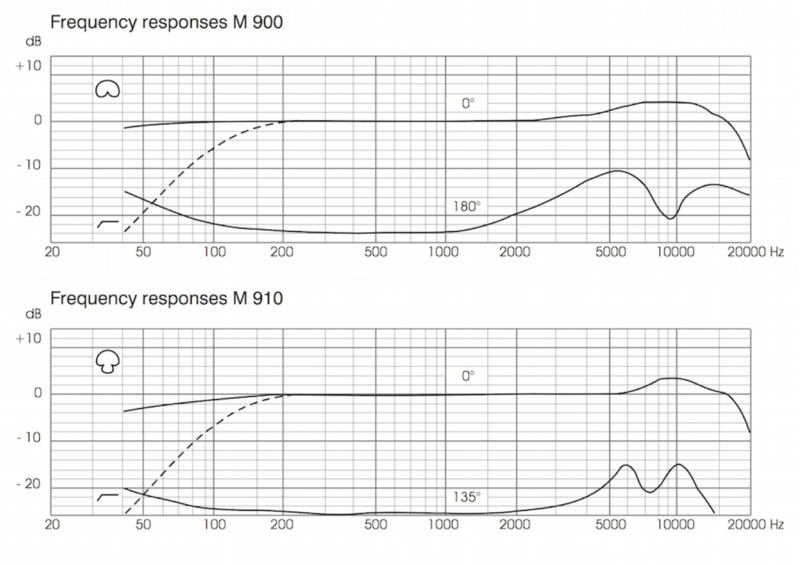 The M 910 exhibits an ideally optimised frequency response for use by soloists. An acoustic filter sits behind the protective grill to reduce pop sensitivity. The transformerless impedance transducer, with balanced output stage delivers a high output level with low intrinsic noise. The membrane is a standard 1-inch gold sputtered Mylar membrane. The capsule has a ceramic backplate that is more stable to temperature changes than the often used brass – the conductive side is then sputtered with chromedioxide – over this is evaporated a one micron coating of Teflon. The Teflon acts as an insulator between the membrane and backplate and prevents damage as a result of incidental contact between the two. The MV200 impedance converter in the M 900, converts the large capacitive impedance of the capsule down to about 150Ω. The electronics also contain a switching power supply to generate the polarisation voltage for the capsule, which is independent of the phantom voltage. This allows the mic to have a higher polarisation voltage than the phantom voltage (c. 80V). This higher polarisation voltage results in higher sensitivity and lower self noise. For compactness and mechanical robustness, all components of the MV200 impedance converters are zero-clearance, surface mounted (SMD) on the board. The M 900 and M 910 can also be used as a radio microphone by using a plug-on transmitter that can supply 48V phantom power. There are quite a few of these on the market, EG: Audio Limited, Sennheiser, Shure, etc. 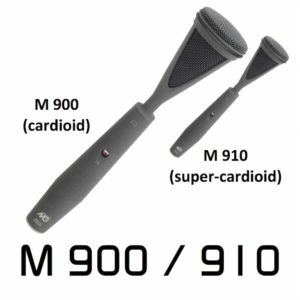 – these partner the M 900 and M 910 very well. Finish: rugged non-reflective dark grey Nextel.